Abstract：Agouti protein is one of key regulatory factors involving in melanin biosynthesis of mammals and birds and plays a role in animal skin color formation. To investigate the relationship between Agouti gene and skin color formation of amphibians, the Agouti gene of giant salamander (Andrias davidianus) was cloned by PCR followed by sequence characterization using bioinformatics tools. Meanwhile, the expression patterns of Agouti gene in 10 different tissues and in 4 types of skin color phenotypes were detected by quantitative real-time PCR. Furthermore, nucleotide mutation sites of Agouti gene were explored by direct DNA sequencing. The obtained Agouti cDNA was 1 068 bp in length and contained a 399 bp open reading frame encoding a peptide of 132 amino acids. Sequence analysis predicted that Agouti of A. davidianus had a conserved Agouti domain. Multiple sequence alignment showed that Agouti of A. davidianus had high amino acids similarity with amphibians and reptiles, but had low similarity with mammals and birds. These results were further confirmed by phylogenetic tree analysis. Quantitative expression analysis showed that Agouti mRNA expressed in all the tested tissues of A. davidianus, and among of which, the maximum expression level was detected in skin. Besides, the expression of Agouti gene in yellow skin was significantly higher than that in other colors of skins. Polymorphism analysis revealed that the cDNA sequences of Agouti genes in A. davidianus were totally identical among different skin color phenotypes. The specific sequence characteristics and expression pattern of Agouti gene in A. davidianus suggested that there might be different regulatory mechanisms of this gene in skin color formation compared with other species. These findings provide helpful information for further studying the role of Agouti in skin color formation of A. davidianus. 张天, 张丽英, 李详龙, 等. 2014. 不同毛色山羊皮肤组织Agouti基因mRNA及其编码ASIP差异表达研究[J]. 畜牧兽医学报, 45(12):1932-1938. Badaoui B, D'Andrea M, Pilla F, et al. 2011. Polymorphism of the goat agouti signaling protein gene and its relationship with coat color in Italian and Spanish breeds[J]. Biochemical Genetics, 49(7-8):523-532. Bagnara JT, Hadley ME. 1969. The control of bright colored pigment cells of fishes and amphibians[J]. American Zoologist, 9(2):465-478. Beukema W, Nicieza AG, Lourenço A, et al. 2016. Colour polymorphism in Salamandra salamandra (Amphibia:Urodela), revealed by a lack of genetic and environmental differentiation between distinct phenotypes[J]. Journal of Zoological Systematics & Evolutionary Research, 54(2):127-136. Bultman SJ, Michaud EJ, Woychik RP. 1992. Molecular characterization of the mouse agouti locus[J]. Cell, 71(7):1195-1204. Dinulescu DM, Cone RD. 2000. Agouti and agouti-related protein:analogies and contrasts[J]. The Journal of Biological Chemistry, 275(10):6695-6698. Duellman WE, Trueb L. 1986. Biology of amphibians[M]. New York:McGraw-Hill Book Co.
Fontanesi L,Beretti F, Riggio V, et al. 2009. Copy number variation and missense mutations of the agouti signaling protein (ASIP) gene in goat breeds with different coat colors[J]. Cytogenet Genome Research, 126(4):333-347. Frost SK, Epp LG, Robinson SJ. 1984. The pigmentary system of developing axolotls. Ⅰ. A biochemical and structural analysis of chromatophores in wild-type axolotls[J]. Journal of Embryology & Experimental Morphology, 81(1):105. Garcia-Borron JC, Sanchez-Laorden BL, Jimenez-Cervantes C. 2005. Melanocortin-1 receptor structure and functional regulation[J]. Pigment Cell Research, 18(6):393-410. Han JL, Yang M, Yue YJ, et al. 2015. Analysis of agouti signaling protein (ASIP) gene polymorphisms and association with coat color in Tibetan sheep (Ovis aries)[J]. Genetics Molecular Research, 14(1):1200-1209. Herczeg G, Matsuba C, Merilä J. 2010. Sequence variation in the melanocortin-1 receptor gene (Mc1r) does not explain variation in the degree of melanism in a widespread amphibian[J]. Annales Zoologici Fennici, 47(1):37-45. Hoekstra HE. 2006. 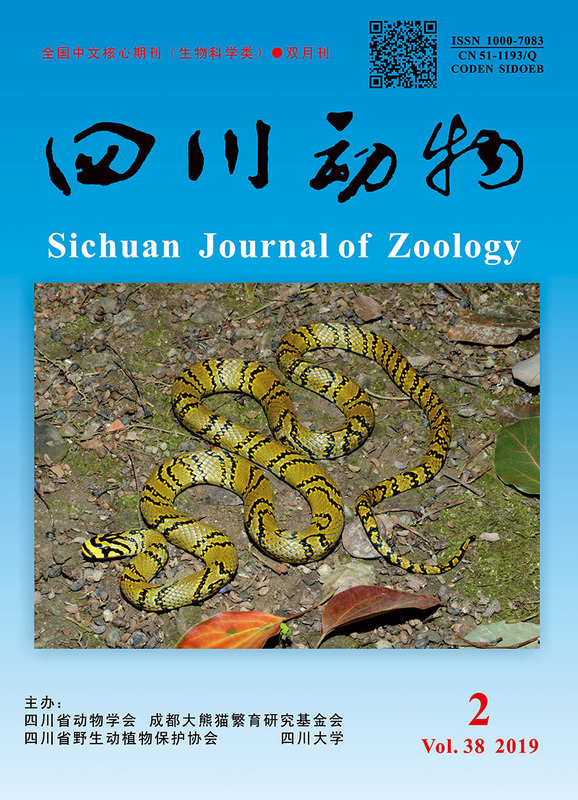 Genetics, development and evolution of adaptive pigmentation in vertebrates[J]. Heredity (Edinb), 97(3):222-234. Jakubczak A, Gryzinska M, Horeckaet B, et al. 2016. Single-nucleotide polymorphism of MC1R, ASIP, and TYRP2 genes in wild and farmed foxes (Vulpes vulpes)[J]. Canadian Journal of Animal Science, 96(2):172-179. Kambe Y, Tanikawa T, Matsumoto Y, et al. 2011. Origin of agouti-melanistic polymorphism in wild black rats (Rattus rattus) inferred from Mc1r gene sequences[J]. Zoological Science, 28:560-567. Kindermann C, Hero JM. 2016. Pigment cell distribution in a rapid colour changing amphibian (Litoria wilcoxii)[J]. Zoomorphology, 135(2):1-7. Kwon HY, Bultman SJ, Löffler C, et al. 1994. Molecular structure and chromosomal mapping of the human homolog of the agouti gene[J]. Proceedings of the National Academy of Sciences of the United States of America, 91(21):9760-9764. Miller MW, Duhl DM, Vrieling H, et al. 1993. Cloning of the mouse agouti gene predicts a secreted protein ubiquitously expressed in mice carrying the lethal yellow mutation[J]. Genes & Development, 7(3):454-467. Mundy NI, Kelly J. 2003. Evolution of a pigmentation gene, the melanocortin-1 receptor, in primates[J]. American Journal of Physical Anthropology, 121(1):67-80. Nadeau NJ, Minvielle F, Ito S, et al. 2008. Characterization of Japanese quail yellow as a genomic deletion upstream of the avian homolog of the mammalian ASIP (agouti) gene[J]. Genetics, 178(2):777-786. Norris BJ, Whan VA. 2008. A gene duplication affecting expression of the ovine ASIP gene is responsible for white and black sheep[J]. Genome Research, 18(8):1282-1293. Obika M, Bagnara JT. 1964. Pteridines as pigments in amphibians[J]. Science, 143(3605):485-487. Ollmann MM, Barsh GS. 1999. Down-regulation of melanocortin receptor signaling mediated by the amino terminus of agouti protein in Xenopus melanophore[J]. The Journal of Biological Chemistry, 274(22):15837-15846. Robbins LS, Nadeau JH, Johnson KR, et al. 1993. Pigmentation phenotypes of variant extension locus alleles result from point mutations that alter MSH receptor function[J]. Cell, 72:827-834. Rudh A, Qvarnström A. 2013. Adaptive colouration in amphibians[J]. Seminars in Cell & Developmental Biology, 24(6-7):553-561. Sakamoto T, Fawcett JA, Innan H. 2017. Evaluating the potential roles of the gray and extension loci in the coat coloration of thoroughbred racing horses[J]. Journal of Equine Science, 28(2):61-65. Schiaffino MV. 2010. Signaling pathways in melanosome biogenesis and pathology[J]. The International Journal of Biochemistry & Cell Biology, 42(7):1094-1104. Suzuki I, Tada A, Ollmann MM, et al. 1997. Agouti signaling protein inhibits melanogenesis and the response of human melanocytes to α-melanotropin[J]. Journal of Investigative Dermatology, 108(6):838-842. Takeuchi S, Suzuki H, Yabuuchi M, et al. 1996. A possible involvement of melanocortin 1-receptor in regulating feather color pigmentation in the chicken[J]. Biochimica et Biophysica Acta, 1308:164-168. Theron E, Hawkins K, Bermingham E, et al. 2001. The molecular basis of an avian plumage polymorphism in the wild:a melanocortin-1-receptor point mutation is perfectly associated with the melanic plumage morph of the bananaquit, Coereba flaveola[J]. Current Biology, 11:550-557. Thibaudeau G, Altig R. 2012. Coloration of anuran tadpoles (Amphibia):development, dynamics, function, and hypotheses[J]. Journal of Mass Spectrometry, 48(1):1-15. Wente WH, Phillips JB. 2003. Fixed green and brown color morphs and a novel color-changing morph of the Pacific tree frog Hyla regilla[J]. American Naturalist, 162(4):461-473. Woodcock MR, Vaughn-Wolfe J, Elias A, et al. 2017. Identification of mutant genes and introgressed tiger salamander DNA in the laboratory axolotl, Ambystoma mexicanum[J]. Scientific Reports, 7(1):1-10. Yasutomi M, Yamada S. 1998. Formation of the dermal chromatophore unit (DCU) in the tree frog Hyla arborea[J]. Pigment Cell Research, 11(4):198-205. Yoshihara C, Fukao A, Ando K, et al. 2012. Elaborate color patterns of individual chicken feathers may be formed by the agouti signaling protein[J]. General and Comparative Endocrinology, 175:495-499.